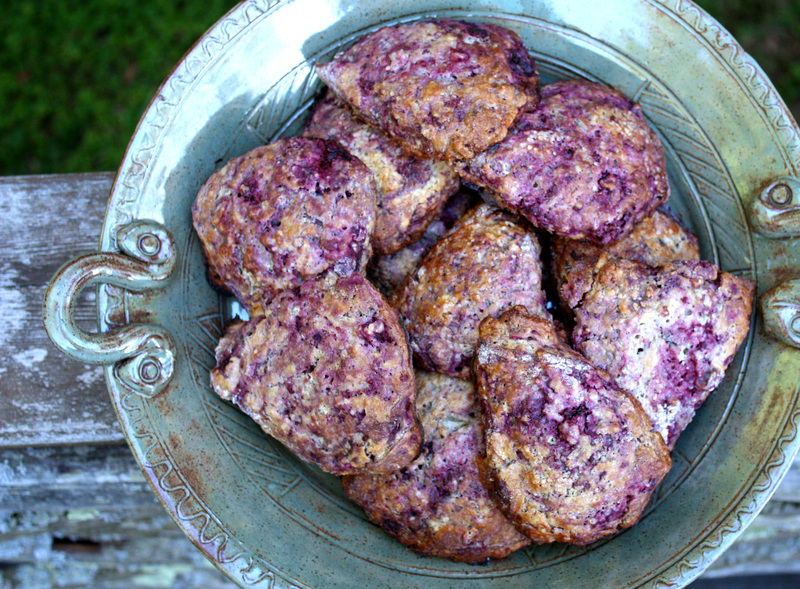 Because woman cannot live on jam alone: wild & crazy purple scones for your Sunday morning. 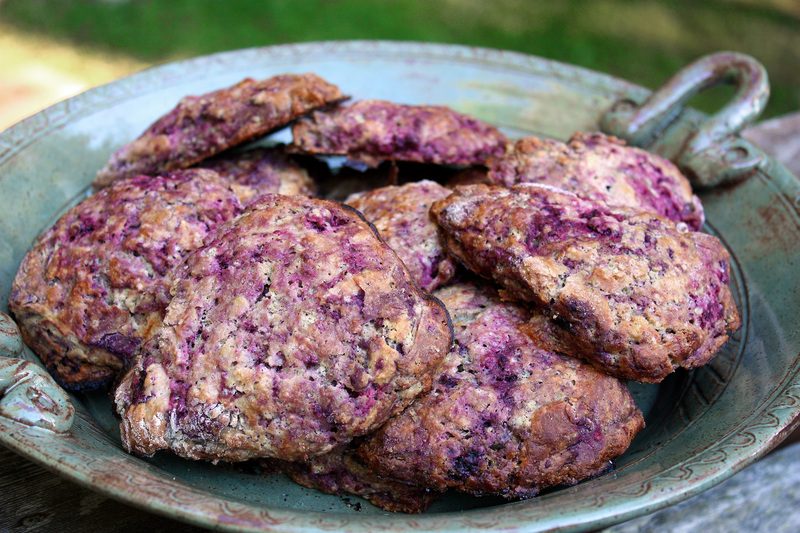 Made with wild black raspberries from my backyard, these delicious scones get their wild purple color (and flavor!) from slightly smushed black raspberries in the dough. Much like many of the area farms, we’ve had a terrible wild berry crop this year; I only saw a few black raspberries on the bushes, the wineberries came and went in a flash, and I haven’t harvested a single blackberry from our wild front yard vines. Despite this bummer-of-a-berry summer, however, berries freeze well, especially the wild ones which tend to be smaller, sturdier and more firm than their commercial counterparts. 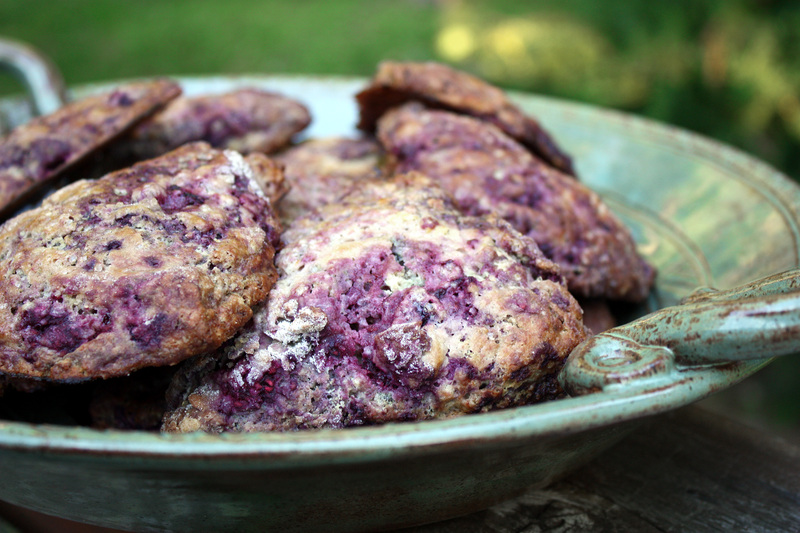 These scones were made with wild berries from last summer’s backyard harvest. 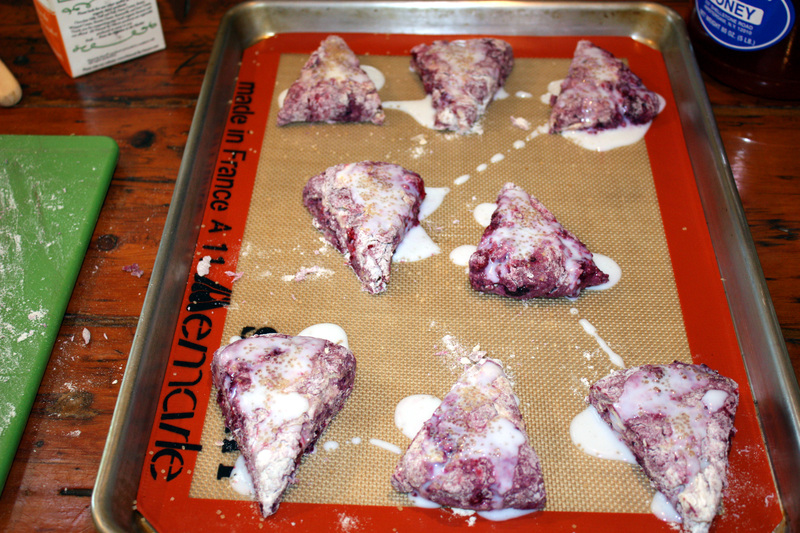 You really have to use frozen berries here; even the firmer wild raspberries will not hold up to the handling of the scone dough, and will make your dough too wet to hold a shape. As it is, this dough was quite wet and a bit difficult to work with (if this is your first attempt at baking scones, I might suggest an easier dough to work with, like cranberry orange or wild blueberry and grapefruit) and the baked scones are a little softer and less dense than my typical scone recipe. But the flavor? The flavor makes up for the extra effort, the sticky purple hands (and the likely-indelible purple stain on your favorite white linen dishtowel). I ate the first three scones within 10 minutes out of the oven; I had to restrain myself from eating a fourth. (They are hidden under a kitchen towel now, because they smell so good that if I walk by them and catch a whiff, I’m eating another before I know it). They have that brilliant depth and purity of flavor that only seems to come with wild foods; commercial berries, even raised-with-love organic berries, don’t come close. The key to making these scones is to move as quickly as you can and to work the dough minimally, so that you can get it formed into scone shapes before the berries have completely defrosted. Be careful when adding the buttermilk; add less than you think you’ll need, and adjust in tiny increments, as the dough will get wetter as you work it and break down the berries. Didn’t you tuck some wild berries into the freezer back in June, waiting for the day when you had time to deal with them? Well then – the time is nigh. Get baking! Preheat oven to 400 degrees F (375 F convection). In a large bowl, combine flours, sugar, baking powder, baking soda and salt; whisk for approximately 1 minute until well blended. Add lemon zest and mix well. Add butter and rub between your fingertips until the mixture resembles coarse meal (alternatively, use frozen butter cubes and pulse in the food processor). Add frozen berries and toss with a fork. Gradually add the buttermilk, tossing with a fork until moist clumps form. Stop adding liquid when it seems the dough will stay together; if the dough is too wet, the scones will lose their shape upon cooking. If the dough seems crumbly and will not hold a shape, add more liquid 1 tbsp at a time. Turn the dough onto a lightly floured work surface (I find it is easiest to split the dough into two portions at this point). Moving quickly, and with well-floured hands, knead briefly to bind the dough; about 4 turns should be enough. 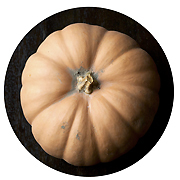 Form the dough portion into a 1- to 2-inch thick round. Cut the round into 8 pie pieces with a sharp knife or pastry cutter. 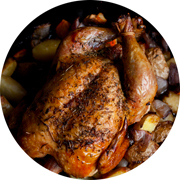 Transfer wedges to a parchment or silicone mat-lined baking sheet, spacing approximately 2 inches apart. Repeat the process with the other half of the dough. Using a pastry brush, glaze the tops of each wedge with buttermilk. Sprinkle a small amount of sugar on top for added crunch. Bake for 10 minutes (8 minutes convection), then turn pans in oven 180 degrees. Continue to bake for 10-15 minutes (7-12 minutes convection), until the tops of the scones are golden brown. Transfer to wire racks to cool. Let cool 5 minutes before serving. Fresh raspberries, even the firm, wild ones, are too fragile for this scone recipe; you might try them in a rolled scone like the Black Currant Scone recipe. I find blackberries too large for scones, but you might pulse frozen blackberries in the food processor and try that. Blueberries, fresh or frozen, work well in scones, as do chopped cranberries or sweet cherries. At room temperature, covered with a clean kitchen towel, for about 3 days. Do not store in plastic as the scones will become soft & limp. Baked or unbaked scones freeze well for up to 6 months; re-heat in a 375 degree F oven for 10 minutes. These look amazing! I will definitely try this recipe. I’ve never made scones before, believe it or not; this motivates me to give it a go. Thank you again! These look great! Bet you could get the same look with beetroot for savoury scones. 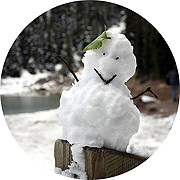 Found your blog today hopping around. 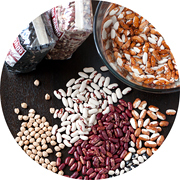 Great recipe here and they look beautiful! Oo, these look incredible! I have to try them and soon!